Our Dow 30 dollar neutral equity long/short strategy gained 2.1% last week. A short position in WBA and a long position in HD contributed towards the result. This is a strategy that is rebalanced each week and holds six long and six short stocks with equal dollar value allocation. The long/short strategy selects six long and six short stocks based on a rank determined by DLPAL LS software after the close of every week. Rebalancing occurs at the open of the following week. The rank used in this strategy is the product of the directional bias and its significance. The directional bias is similar to a sentiment indicator but derived solely from price action. For more details see this article. Below is the output of DLPAL LS after the close of March 29, 2019, with calculations for the return of next week ending April 5, 2019, from the open to the close, shown under Return column. The average close to close and open to close returns are also calculated by the tool. Five long and three short stocks provided gains with 1.96% average open to close return. Due to previously held positions before rebalancing on April 1, 2019, the net return after including $0.01 commission per share was 2.1%. It may be seen that the WBA short gained 13.94% from open to close but the strategy was already short the stock from the previous week and the actual gain from close to close was 13.56%. 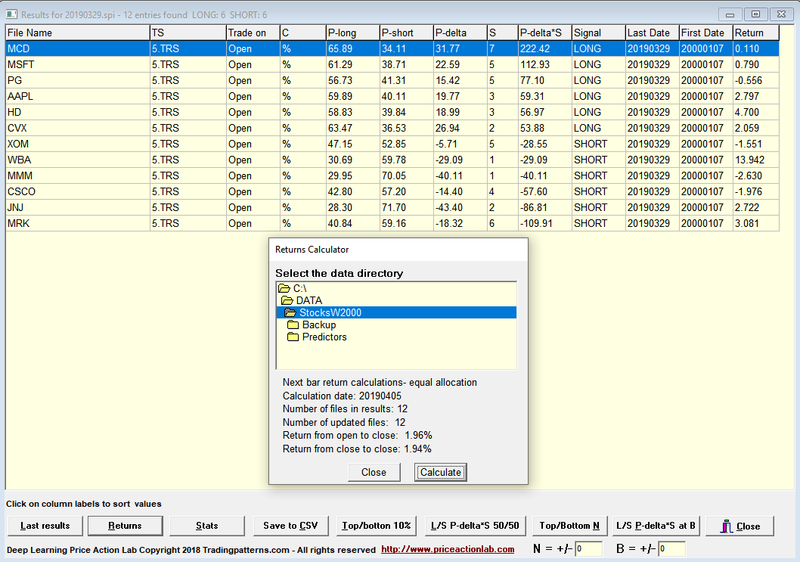 DLPAL LS software generates and updates historical data files of features that can be used to backtest various strategies, both long/short but also directional. For more articles about DLPAL LS click here. Hedge funds and professional traders can receive a free fully functional demo of DLPAL LS valid for 20 days. For more details and information on how to order a demo click here.